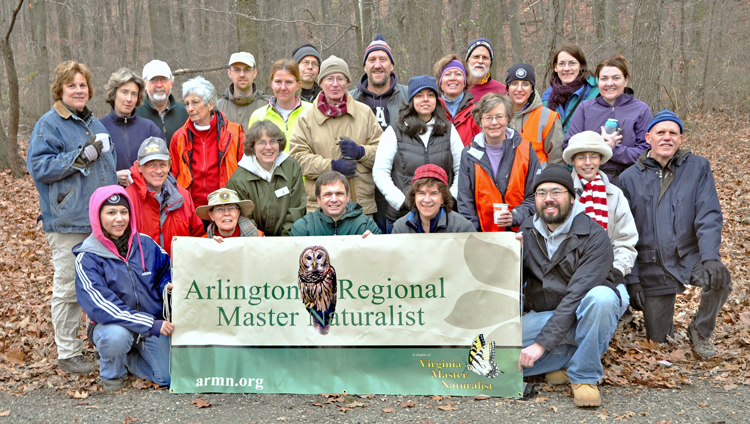 We had another inspiring turnout December 17, with 26 volunteers (Master Naturalists, Tree Stewards, Americorps, Windgate residents, hikers, spouses and friends of the above) reluctantly ending the invasive work after almost two hours, in order to turn our attention to Deep Time. We began the morning again with coffee, cider, and donuts on a cool and cloudy day, fueling more intensive work on the natural area between the bikepath and the drainage ditch. Some revisited the area worked last time, continuing to dig the remaining extensive root systems of the Multiflora Rose forest that had been left in the ground in November (Jerry Schrepple brought his own pickaxe and Margaret Chatham her own weed wrench for the heavy work). Others such as Cliff Gay and Martha Cogdell pushed on upditch, clearing the rose back to the edge of the ditch. Still others worked on Garlic Mustard patches in the area. Allison Willochs and Elizabeth Rives, dedicated Tree Stewards, freed Spicebush ((Lindera benzoin) from choking Porcelainberry vines. Again, as in November, great fun and very satisfying. Back to Deep Time, Joe Marx, Geology Professor at NVCC, then compressed a billion years of Barcroft geology into a stimulating 1.5 hours for 30 of us. Joe talked us through the forming, splitting, then forming again and splitting, of the ancient North American continent and adjacent oceans. He made especially apt references to current geography and geological processes such as the island arc Japan moving toward China, or the 60-foot seafloor jump of the 2004 Sumatran earthquake and resulting underwater cliffslides, to illustrate the bedrock geology of Barcroft. Check out the entire group standing on the Indian Run formation bedrock in the middle of Four Mile Run, a “metasedimentary melange” that formed in a similar geological setting as that Sumatran earthquake, only some 500 million years earlier, evidence that, in geology, what goes around comes around. More recent geological events (only 145 to 100 million years ago) produced the sandy and clayey layers of the Potomac Formation that lies on top of the bedrock, and is responsible for the special hydrology that produces the seeps and bog that support the valuable plant communities of Barcroft Park. In a fascinating detail with implications for possible ecological work on the park, Joe noted that rainwater falling on the Skyline area of Baileys Crossroads, the surface source of the aquifer that feeds the Barcroft bog, takes 27 years to travel from Skyline to the bog. We are grateful to Joe for sharing his knowledge in such an approachable, stimulating way, a fitting, final Barcroft focus project event of 2011. In a subsequent post we will report on ARMN efforts and results in Barcroft Park in 2011, and set the stage for our work there in 2012. 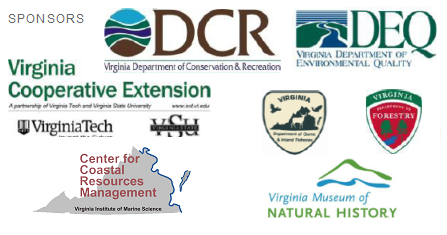 Thanks to everyone who showed up in December, and we look forward to more good work together in 2012. This entry was posted in Barcroft Park and tagged community outreach, geology, invasives by christinearmn. Bookmark the permalink.